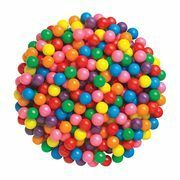 Bulk Barn Bulk Barn: $3.00 Off Your $10.00+ Purchase from September 13 to 19 New Coupon! Take $3 Off Your $10+ Purchase! Eating healthy is fun until it's 11:00 PM and you realize you don't have any snacks, so stock up at Bulk Barn, because you can take $3.00 off your purchase of $10.00 or more with their new coupon! There are some restrictions, as the coupon cannot be used on gift cards, in conjunction with the 10% Seniors' & Students discount or with other promotional offers. 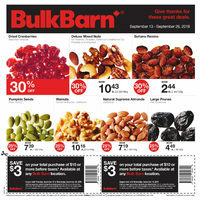 This coupon is valid from September 13 to 19 at all Bulk Barn locations -- click here to find the location nearest you. Not sure of what to buy? View their flyer here on RedFlagDeals to get some inspiration!